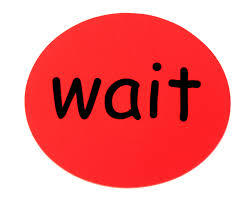 In this fast-paced society, the word "wait" is looked down upon, not used very often, or used with disdain. I admit that I sometimes buy into the notion that I shouldn't have to wait. Why should I wait? If I want it, I should have it. Now. The enemy of my soul wants me to buy into that lie. Christianity certainly is a confusing mixture of paradoxes. On the one hand, we tell God to "lead me where my trust is without borders." We agree with Him that we are to adopt a 4th child. We go through the necessary process, paperwork, medical exams, financial screenings, criminal history background checks, face-to-face interviews with a social worker, fundraisers, grant-writing, etc., etc., etc. To get where we are today: waiting on the FINAL step before we can travel to get Gladdie. And God says WAIT. Just that one word. Wait. All my adoptive-mom friends who are in the process too have achieved the final step. They are almost to travel or have already come home with their children. But why, Lord? Why should we have to wait? We have done what you asked. We have "jumped through the hoops." We have crossed the "T"s and dotted all the "I"s. Why would you have us come ALL THIS WAY and then tell us to wait???? Why would you lead us SO FAR beyond the comfortable, easy borders of our trust to leave us in the tundra of The Wait?? Doesn't He WANT Gladdie to be in a better situation? Doesn't He WANT us to be united as a family? Doesn't He WANT to use our story to touch the hearts of others? It's easy to get discouraged. I've cried MANY a tear in the last 3+ weeks, waiting for this final step of the process. He knows and sees all. He reads the entire book of humanity; I see a snippet of one page. I do not need to know the outcome of this adoption journey because He already does. I do not need to know why we wait, because He already knows. All I need to do is to be obedient in the wait. So, I will. I will wait. And my Father will come through. Maybe not today. Maybe not tomorrow. Maybe not for a while. But He will. Of that I am sure. Lord, "lead me where my trust is without borders," even if that means to The Wait.